With reference to the latest market forecast report published by Transparency Market Research, on the title 'Legalized Cannabis Market: Global Industry Analysis and Opportunity Assessment 2018-2027', revenue generated from the global legalized cannabis market has been estimated to be valued around US$ 19.96Bn in 2018, which is projected to increase at a CAGR of 17.2% to US$ 81.4Bn in 2027, during the forecast period (2018-2027). The global legalized cannabis market is segmented on the basis of end use, form, product, compound, and region. On the basis of end use, the legalized cannabis market is segmented into medicinal and recreational cannabis. The recreational end use is anticipated to account for a value share of 52.3% in the year 2018 owing to increasing number of countries legalizing cannabis, and growing demographics of youth inclined towards consuming cannabis. On the basis of product type, the market for legalized cannabis is categorized into cannabis herb and cannabis resin. Cannabis herb is expected to dominate the product type segment with a market share valued at 73.8% in 2018. The legalized cannabis market is further bifurcated on the basis of form into whole and processed segment. The raw cannabis market is expected to register a fuelling CAGR of 17.4% over the forecast period. On the basis of compound, the legalized cannabis market is divided into THC dominant, CBD dominant, and balanced THC & CBD. The THC dominant cannabis is anticipated to account for more than 50% value share of the global legalized cannabis market on the basis of compound. The report for the legalized cannabis market has been segmented into North America, Asia Pacific, Europe, Latin America, and Middle East & Africa. North America constitutes 63.1% of the market share for legalized cannabis market in the year 2018. The region is anticipated to register a bolster CAGR of 18.2% over the forecast period. Legalized cannabis is gaining market traction in North America due to escalating demand among consumers and increasing legalized cannabis for medical and recreational uses. Besides, high private and public investment for research and the development of safer forms of legalized cannabis for consumption such as oils, vapes, and tinctures, and other edibles are anticipated to positively reinforce market growth in the North America. 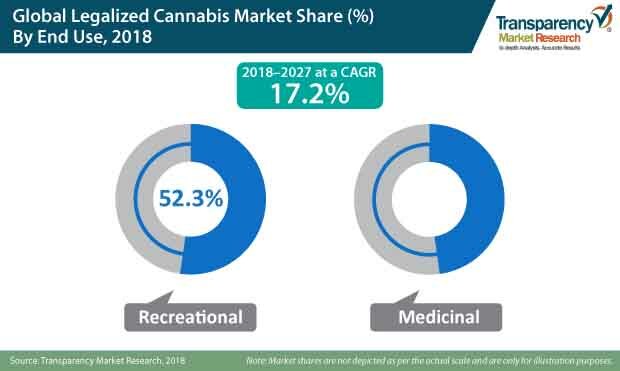 Besides, globally medicinal cannabis is witnessing a growing demand and countries are rapidly in surge of legalizing the medical usage of cannabis which is expected to increase the legalized cannabis multiple folds over the forecast period. Countries are moving towards legalization of cannabis for recreational purposes to prevent illegal usage, trafficking, and crime, this in turn is expected to thrust the growth of recreational cannabis. The ease of availability of recreational cannabis along with the lengthy purchase and approval process for medical cannabis prescription is expected to trigger this change and boost recreational cannabis market. In February 2019, Tilray, Inc. acquired Natura Naturals Holdings Inc., a cannabis cultivating company. The acquisition was aimed to boost the company’s capacity to supply legalized cannabis products over Canada. In October 2018, CannTrust Holdings, Inc., announced the launch of recreational brand “Peak Leaf” to increase the product portfolio legalized cannabis and to cater adult consumers who consume cannabis for recreational purposes. In August 2018, Terra Tech Corp., entered into a partnership with Valiente Group to make a line of cannabis-infused beverages under the brand IVXX. In June 2016, Aphria Inc, announced that it has done a strategic agreement with a Denmark based company “Danish Company” (Schroll Medical) a subsidiary of European flower supplying company, Schroll Flowers. The aim of strategic partnership is to produce organic Pharma grade legalized cannabis for the global market.